Electrical Conduit Market size will surpass USD 9 Billion by 2024, as reported in the latest study by Global Market Insights, Inc. Rising measures to curb fire, electrical supply faults, health, and other operational hazards along with favorable government policies pertaining to the development of standard product configurations will drive the overall electrical conduit market. Effective electrical infrastructure deficit across developing regions in line with ongoing revamping of existing grid infrastructure across developed nations will assimilate a favorable business landscape. Increasing dependency on manufactured goods along with rapid economic escalation across developing countries have been the key factors driving industrial and commercial growth. Rising electricity consumption from industrial facilities and commercial establishments have positively swayed the global electrical conduit market share. In addition, positive consumer outlook favored by regulatory reforms towards electrification across grid isolated areas will further complement the business outlook. Power supply across large scale industries and manufacturing facilities have been critical applications, demanding safety and reliability of the entire electricity network. 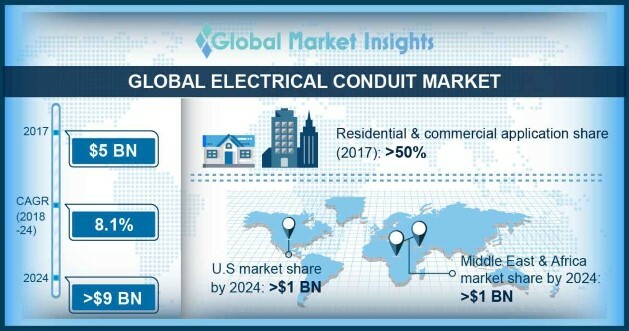 Thereby, growing measures to integrate a safe operational environment along with aesthetic proximities will enhance the > 3 marked electrical conduit market growth. Furthermore, increasing metal extraction activities coupled with rapid expansion of railway infrastructure require large scale electric network expansion which in turn will positively influence the industry scenario. The Middle East and Africa electrical conduit market is anticipated to exceed USD 1 billion by 2024. Extensive increase in electricity consumption along with growing demand for an effective electric infrastructure will fuel the product demand. Rising private funding from financial institutions including the IFC, the World Bank, and the African Development Bank toward electrification across the region will boost the industry potential. Lower cost, ease-of-installation and effective corrosion resistance have been the key factors complementing the adoption of underground electrical conduits. In addition, developed nations have continuously been focusing on the installation of underground electrical networks to sustain ecological damage from overhead lines. Positive utility inclination favored by huge ecological advantages associated with the underlined technologies will escalate the underground electrical conduit market growth. Extensive power distribution infrastructure across large metal & mining industries along with high dependency on railway electric networks will complement the global metal electrical conduit market size. Although, ongoing adoption of effective non – metallic and flexible conduit technologies have hindered the product deployment however, standardized product specifications positively influenced by high cost of re-installation will endure the overall business scenario. Asia Pacific electrical conduit market in the recent years has gained momentum on account of rising energy consumption and ongoing regulatory re-structuring across the region. Developing economies are considered as favorable areas as they continue to complement the existing infrastructure and power capacities to meet the increasing demand for electricity. The Government of India (GOI) in 2016, introduced its “One Nation One Grid” program to interlink all the state and national grids in order to achieve the target of a single tariff structure across the nation. Eminent industry players across the electrical conduit market comprise of Schneider, ABB, Aliaxis, Hubbell, Astral, Atkore, Legrand, Mexichem, Hellermann Tyton, Champion Fiberglass, Wienerberger, Electri-Flex, ANAMET, Cantex, and Zekelman.